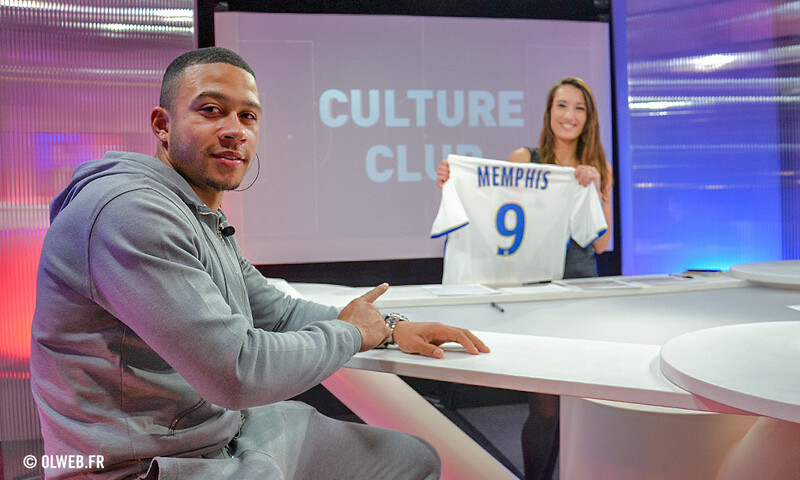 On Wednesday evening, OL's new recruit Memphis Depay was the special guest on the Culture Club show, hosted by Héloïse Basson. "I feel great, in full fitness. My first week has been good. Training has gone well. I'm getting up to speed. I'm very happy to be here, to play in this team. My teammates have been really kind. Everything's going very well. I didn't know what to expect. But everyone's been very enthusiastic in welcoming me. OL seems like it's a big family, that's my first impression. This is a great club with a magnificent stadium." "My first match at home was in front of an almost capacity crowd. I hope that the fans appreciated my first performance. They gave me plenty of encouragement, which is great. I was focused on the game, ready to take part. I was very happy to play for the first time; I hope that my next opportunity comes very soon. I'm ready for the next match. I'm in good physical condition." "Playing at home is playing at home. We have to win every match at home. This is also important to the fans. We have to get a run of wins going. I don't know much about the Lille team. We also need to win against the lesser teams to get ahead in the race for a top-three finish." "I've heard that this was a great rivalry, that it was the match of the year. What's most important is to win it. We'll pull it off." "On the left flank of the attack, where I've played for three to four years. But I can play in several positions up front as well as in the number ten role. I think that I've been at my best on the left and have caused defences the most problems from there... I think that my linking with Alex Lacazette on the field will work well. He makes good calls." "It wasn't easy. Expectations were high. I didn't have that much opportunity to play; it was tough. I needed to play. It was a completely different experience from my time in Holland. I've learned a lot. I now want to play games and show what I'm capable of." "I sang a song at the hotel as part of my hazing. I didn't quite understand what I had to do so I sang and danced at the same time. Everybody laughed, it was funny. The team are very kind and easy going. There's still a language barrier, but everybody made an effort to communicate... I play video games, I read, I don't live a crazy life. I'm a normal person... My tattoos? The lion is a symbol for me, a feeling of power. It's a sign of playing for Lyon today."